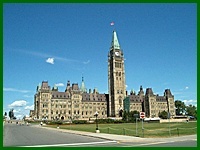 n September 1999, IFS Associates was retained by Public Works and Government Services Canada (PWGSC) to inventory and investigate the vegetation on the escarpment surrounding Parliament Hill in Ottawa. This 4.3 hectare (ha) study area encompasses the forested slopes running from the Plaza Bridge in the east to behind the Supreme Court in the west. 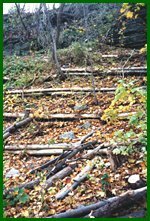 The primary purpose of this study was to investigate how vegetation can be best used as a natural means to help stabilize surface soil movement on the Parliament Hill escarpment. The impetus for conducting this study was the excessive downward movement of surface soil (“soil creep”), ravelling and erosion occurring over much of the sloped area which has raised concerns about overall slope stability, long-term forest development and sustainability, public safety and aesthetics of this culturally important site. Reviewed previous studies of the escarpment with a view to building upon past attempts to reduce the soil creep, ravelling and erosion problems. Inventoried slope vegetation (species, size, condition) and group areas of similar vegetation into compartments. Identified an overall strategy and develop specific management regimes, on a compartment by compartment basis, to control the rate of soil movement. Established permanent sample plots at points along the escarpment to facilitate monitoring the results of management interventions over future years. Provided an implementation strategy and schedule of work for those areas requiring rehabilitation. Included in the strategy will be rehabilitation priorities based on budget and site requirements. This is an ongoing project. IFS Associates continues to work closely with its network of partners and government authorities in addressing the issues affecting the forests around Parliament Hill.